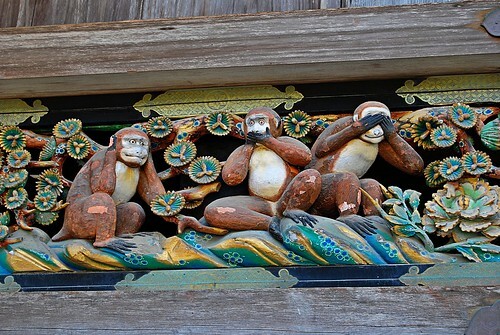 The famous three wise monkeys ("sanzaru" in Japanese). According to wiki, these carvings were the main source that popularized the famous maxim of the monkeys. These were carved over a door of a stable (Shinkyu) within the Toshogu shrine vicinity and it is dated way back from the 17th century. There are no paintings on the Shinkyu. Sculptures of Sansaru "Three Monkeys" were put on the crossbars instead. The Sansaru consists of 8 panels like a picture book. Monkeys had been treated as guardians of horses since early times. Therefore, there was a custom to keep monkeys in the stable until Muromachi period.